The season is still relatively young with teams having played around 12-14 games. The playoffs are far, far away but some teams have already shown that they are incapable of reaching the post-season (Cavs, Kings, Pistons) while others have shown that maybe they can make it to the "real" season (Warriors, Bobcats, Nets). Meanwhile, there are teams that have performed according to what most critics and analysts believed them to be capable of doing (Spurs, Heat, Thunder, Grizzlies). Of course, there are those who have missed expectations and those who have exceeded them. Mr. Hoop Nut (Enzo) wrote articles on the Resurgent and Disappointing players of the season (so far) while I will reflect on the teams that have exceeded expectations or missed predictions (for now). The struggles of the Lakers are obviously the top story. They fired Mike Brown after 5 games then Steve Nash got hurt and has played only 2 games where he looked awful (5 ppg, 4 apg). His return is still uncertain and when Nash comes back, more adjustments will be made by the Lakers. Patience runs very thin within the organization and with Kobe. The Pau Gasol trade rumors have started after he got benched in the 4th vs the Kings and his numbers are down. Bryant has started to take over the game. You can see him force more shots and control/dictate the offense which are not always the best ways to success. Howard had back-to-back games where he did not get double digit points or rebounds. The Lakers are no longer in the bottom of the Western Conference but they have not impressed with their wins. The Nets and the Mavericks (without Dirk) are their significant wins of the season. The Pacers were supposed to be among the elite in the East. Some expected them to be 2nd or 3rd (including me) in the East standings. So far, they have proven to be the opposite of elite. They will receive credit for being an elite defensive (3rd) and rebounding (2nd) team but at the same time, they have struggled offensively in scoring (28th) and passing the ball (27th). Their inconsistency has resulted in a below .500 record which places them out of the playoffs for now. The Pacers have an excuse with Danny Granger being injured but the remaining players should be good enough to compete and have at least a winning record. Roy Hibbert has showed that he is NOT deserving of a max contract while Paul George has not exactly been scoring in bunches consistently (he did have a 37 point game vs. the Hornets). His highest point total before that shooting outburst: 20 points (2x). 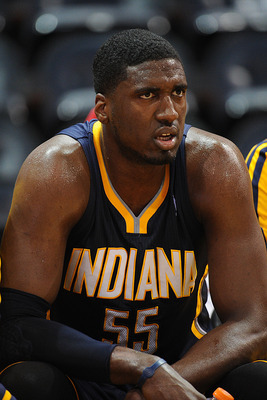 More is expected from Hibbert and George if the Pacers want to make the playoffs. The Celtics proclaimed that this year's team is their strongest and deepest in the last 5 years. Hard to argue against that when the Celtics added Courtney Lee, Jason Terry, Leandro Barbosa and Jared Sullinger. They also got Jeff Green and Chris Wilcox back from injuries. So, how come they are only 8th in the East? Shouldn't they be at least 2nd in the standings? Rajon Rondo is still on his assists streak of 10+ in the last 37 games yet the Celtics arent winning a lot more than usual. Maybe Rondo's focus of getting his streak going has somewhat interfered with his desire to attack the rim and the player guarding him? The Celtics also have issues rebounding the ball. They are last in the NBA in rebounding. Hard to imagine a team with KG, Pierce and Rondo being last in rebounds since these guys are all pretty good rebounders. The new additions of Lee and Terry have not been immediate successes. Lee has been a big disappointment (demoted from starter to bench) while Terry (starter now) doesnt even average more points than Ray Allen of the Heat. The T'wolves have legitimate excuses/reasons for being out of the playoffs and losing 5 straight after starting 5-2. They have had a myriad of injuries (Love, Rubio, Budinger, Barea, Pekovic, Roy, etc) which have thrown their rotation in disarray. In some games, Coach Adelman was able to dress less than 10 players. Kevin Love came back from his hand injury a month earlier but his return has not resulted into wins (0-3) even though he averaged 24 and 14. Derrick Williams (#2 pick last year) has struggled again this year and he has fallen out of the rotation. He did not play in 2 of the last 3 games via coach's decision. The T'wolves hoped that Williams would take advantage of the extra playing time when other players were hurt but he did not deliver. He even started 9 of the 10 games that he played in. Could he be following in the footsteps of Wesley Johnson, the 4th pick of 2010 by the T'wolves who was a major bust? Kyle Lowry and Jonas Valanciunas were supposed to eleveate the Raptors into maybe sneaking into the playoffs. Jose Calderon and DeMar DeRozan are also playing their best ball while Bargnani has been healthy. Yet, the Raptors are near the bottom of the Eastern Conference. My sleeper pick for the 8th spot in the East has not delivered in their first 14 games. The Raptors have been terrible in clutch situations and in overtime. They are 0-2 in OT and they are 1-3 in games decided by 3 points or less. Even that lone win vs. the Pacers saw the Raptors only score 9 points in the 4th quarter to escape with a 2-point win. Andrea Bargnani continues to rebound like a point guard (less than 5 boards a game) and he is shooting below 41% after going 2-19 with 4 points against the Spurs. When your jumper is not working, it's time to drive to the hoop or at least get some assists. Bargnani went 0-1 from the foul line and he had 1 assist. The Knicks had a little hiccup in Texas when they lost to the Mavs and Rockets over the weekend. Still, their 9-3 start has been impressive since they are doing it without Amare and they playing better defensively. Even Carmelo has placed more effort into playing defense and distributing the ball. Make no mistake, Melo still loves his isolations (2nd in iso plays to Kyrie Irving) but he has been more efficient in shooting the ball. His shooting percentages are all up from last year. The Knicks are also getting exceptional play from Raymond Felton and JR Smith. Felton has been very good and he has been an upgrade over Jeremy Lin. The erratic JR Smith is also sizzling from downtown, making over 50% of his shots. The Knicks rely a lot on the long ball, will that trend continue when Amare comes back and will the shots keep falling during the season? The Bobcats have already tied their win total from last season. They are winning games in the clutch and they are led by Kemba Walker and Ramon Sessions. The Bobcats have won 6 of their 7 games with a margin of 4 points or less. Four of the games were single possession wins. Kemba Walker has nailed 2 game-winners already while Sessions has been impressive in the clutch. Byron Mullens has been a decent scoring option and he has increased his range to the three-point arc. His shooting percentages are below 40% but Mullens has already made 19 threes (just 12 made threes last year) in just 12 games. The Bobcats are also winning games without their starting shooting guard, Gerald Henderson who has missed the last 10 games. Ben Gordon has been good off the bench while rookie Michael Kidd-Gilchrist has been steady with his 12 and 7. Another team from New York has been playing well. Who would have thought that both the Nets and Knicks have better records than the Lakers, Clippers and Celtics? The Nets have been winning games by playing excellent defense. They are now the best team in points allowed at 91.5 per game. The Nets have also won games without Gerald Wallace and MarShon Brooks. Brook Lopez leads the team in scoring, although his rebounding needs more work. His rebounding flaw can be overlooked since Humphries and Reggie Evans are monsters on the glass. Deron Williams has started slowly with his 16.8 ppg and 8.5 apg on below 40% shooting while Joe Johnson is hovering at 40% shooting as well. Still, with all those problems on shooting from your all-star back court duo, the Nets are still winning games. The Warriors are missing Andrew Bogut yet they are 3rd in the league in rebounding. They have had good wins over the Clippers, Hawks, Mavs and Nets. Carl Landry has been amazing off the bench (14 and 7) while rookie Harrison Barnes is starting to play better. Barnes has 3 double-doubles for the season already. The injury bug has stopped with Bogut (Brandon Rush is out for the year due to ACL injury) while Steph Curry has not missed a game yet (knock on wood). Klay Thompson has been okay as the starting shooting guard. The sweet shooting back court duo aint shooting the ball that well yet but the Warriors are finding ways to win. A major part of that is David Lee's play as he averages 16 and 11. Andrew Bynum has not played for the Sixers yet. There's talk that he may never play for them due to his problematic knees and Bynum will be a free agent this summer. So, how come the Sixers are above .500 and in the playoff mix? First, they defend well (7th in points allowed) and they take care of the ball (2nd in turnovers). The Sixers also force 3 more turnovers from their opponents which they can turn into transition baskets from downtown when you have shooters like Nick Young, Dorell Wright, Jason Richardson and Jrue Holiday. Evan Turner is starting to play better and is showing his critics why he was picked 2nd overall two years ago. Turner is getting 13 ppg, 7.4 rpg and 4 apg. The best part about the Sixers is Jrue Holiday who is suddenly turning into the 3rd best point guard in the East (after Deron and Rondo). Holiday is averaging career-highs in points (18.6) and assists (9.2).